Patellofemoral pain affects a large proportion of the population, from adolescents to older adults, and carries a substantial personal and societal burden. An international group of scientists and clinicians meets biennially at the International Patellofemoral Research Retreat to share research findings related to patellofemoral pain conditions and develop consensus statements using best practice methods. This consensus statement, from the 5th International Patellofemoral Research Retreat held in Australia in July 2017, focuses on exercise therapy and physical interventions (eg, orthoses, taping and manual therapy) for patellofemoral pain. Literature searches were conducted to identify new systematic reviews and randomised controlled trials (RCTs) published since the 2016 Consensus Statement. The methodological quality of included systematic reviews and RCTs was graded using AMSTAR and PEDro, respectively. Evidence-based statements were developed from included papers and presented to a panel of 41 patellofemoral pain experts for consensus discussion and voting. 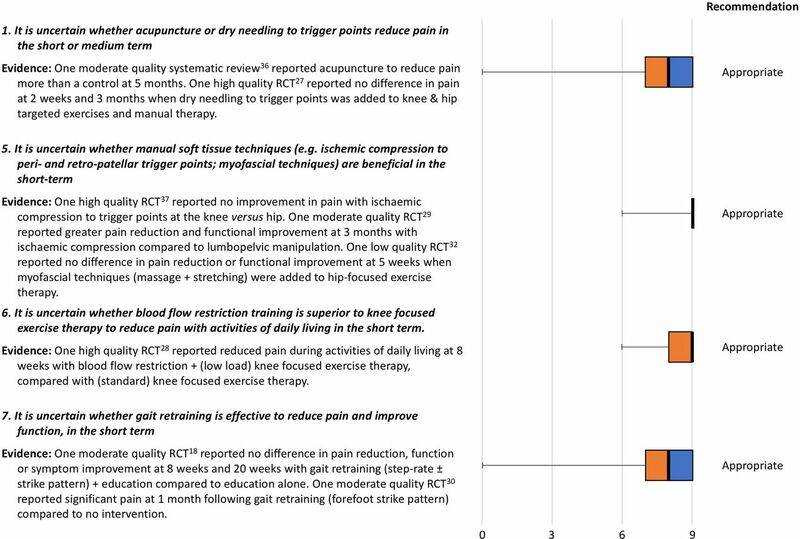 Recommendations from the expert panel support the use of exercise therapy (especially the combination of hip-focused and knee-focused exercises), combined interventions and foot orthoses to improve pain and/or function in people with patellofemoral pain. The use of patellofemoral, knee or lumbar mobilisations in isolation, or electrophysical agents, is not recommended. There is uncertainty regarding the use of patellar taping/bracing, acupuncture/dry needling, manual soft tissue techniques, blood flow restriction training and gait retraining in patients with patellofemoral pain. In 2017, we launched the International Patellofemoral Research Network (www.ipfrn.org) to consolidate and grow our patellofemoral research community, facilitate collaboration and disseminate patellofemoral pain knowledge to clinicians and the general public. The 6th International Patellofemoral Research Retreat will be held in Milwaukee, Wisconsin, USA, in October 2019. Patellofemoral pain is a common, chronic musculoskeletal condition, presenting as pain around or behind the patella during patellofemoral joint loading activities (eg, squatting, stair ambulation and running).1 Patellofemoral pain has an annual prevalence of approximately 23% of adults and 29% of adolescents in the general population and affects almost 36% of professional cyclists.2 Patellofemoral pain tends to persist in about 50% of people,3–5 in some cases for up to 20 years.6 Pain and symptoms associated with patellofemoral pain limit participation in daily and occupational tasks and reduce levels of physical activity.5 7 Importantly, patellofemoral pain may precede the onset of patellofemoral osteoarthritis,8 9 which has no cure. Every 2 years, scientists and clinicians who are active researchers in the field of patellofemoral pain meet at the International Patellofemoral Research Retreat. The aims of the Retreat are to: (1) share the latest patellofemoral pain research developments; (ii) Discuss the literature to formulate consensus statements to disseminate knowledge; and (3) develop a future research agenda for patellofemoral pain. The 6th International Patellofemoral Research Retreat will be held in Milwaukee, Wisconsin, USA, in October 2019. In 2017, the International Patellofemoral Research Network (iPFRN) was launched, bringing together past and present Retreat participants into a cohesive, collaborative network of patellofemoral pain researchers from around the world. We also launched the iPFRN website (www.ipfrn.org), a platform to share news on upcoming Retreats, recruit new members to the research community, facilitate collaboration and disseminate patellofemoral pain knowledge to clinicians and the general public. The 5th International Patellofemoral Research Retreat (iPFRR17) was held on the Gold Coast, Australia, from 18–20 July 2017. The 51 attendees from 10 countries represented the disciplines of physiotherapy, athletic training, podiatry, biomechanics, imaging, biomedical engineering and human movement science. Professor Richard Souza (University of California, San Francisco) shared his expertise on advanced imaging methods for patellofemoral pain and patellofemoral osteoarthritis. Associate Professor Thor Besier (The University of Auckland) spoke about how musculoskeletal modelling can be used to improve assessment and treatment of people with patellofemoral pain. Fifty-five peer-reviewed abstracts were accepted for podium presentation. These were grouped into seven categories across nine sessions: (1) imaging; (2) epidemiology and pain; (3) muscle and strength; (4) biomechanics and joint health; (5) biomechanics and patellofemoral joint stress; (6) treatment; and (7) psychology and pain. On the final day of the Retreat, we held four structured consensus discussions on key topics. We synthesised current knowledge on patellofemoral pain from published literature, new studies presented at iPFRR17 and expert opinion to develop consensus statements on each topic. Agreement was reached by discussion at the meeting at the Gold Coast and by email discussion of the draft statement. We repeated the search strategy we had used for the 2016 Consensus Statement11 to search MEDLINE, Embase, CINAHL and Current Contents for systematic reviews and randomised controlled trials (RCTs) (CJB). Searches included literature from June 2015 to July 2017, covering the period since the 2015 meeting. Titles and abstracts were searched using the following patellofemoral pain terms: (patella OR patellofemoral) AND (pain OR syndrome OR dysfunction).12 To identify systematic reviews, this search was narrowed by combining with the keyword ‘review’. To identify RCTs, patellofemoral pain terms were combined with (controlled trial OR clinical trial). Additional searches were performed in the Physiotherapy Evidence Database (PEDro). That list was provided to all authors of this consensus statement, and they were asked to suggest papers they considered were missing. This did not lead to any additional papers being included. Papers were eligible for inclusion if they: (1) were the most current systematic reviews (including meta-analyses) or RCTs that had been published since the most recent systematic review; (w) evaluated one or more physical interventions (non-surgical and non-pharmacological), with either no treatment or another physical intervention as the comparator; (3) evaluated outcome using a measure of pain (eg, pain visual analogue scale (VAS)), patient-reported improvement (eg, global rating of change) or function; (4) randomly allocated participants to intervention groups; and (5) were full-text papers published in English. Two reviewers (CJB, DdOS) determined the eligibility status for each paper identified by the search strategy. The methodological quality of each included paper was rated by three independent reviewers (NJC, CJB and MvM). Systematic reviews were graded using the Assessment of Multiple Systematic Reviews (AMSTAR) tool13 (CJB and MvM) (total score/11). PEDro was used to grade the methodological quality of RCTs (NJC and MvM) (total score/10). Discrepancies between raters were discussed at a consensus meeting, with an additional reviewer (KMC) resolving any disagreement. To maintain consistency with the 2016 Consensus Statement,11 systematic reviews and RCTs were allocated the following level of evidence, based on AMSTAR and PEDro scores, respectively: high quality ≥7; moderate quality 4–6; and low quality ≤3. Consistent with the 2016 Consensus Statement,11 we classified included studies under the following headings: (1) exercise therapy (general, hip focused and knee focused); (2) combined interventions (two or more of the following: exercise therapy, foot orthoses, patellar taping, manual therapy); (3) foot orthoses; (4) patellar taping and bracing; and (5) other adjunctive interventions (eg, manual therapy, soft tissue therapy, acupuncture, gait retraining and electrophysical agents). If a study investigated the effect of adding an adjunct modality to a combined interventions programme, compared with combined interventions alone, this was classified as other adjunctive interventions. For an intervention to be considered as a new category, a systematic review on the specific intervention must have been identified by the search strategy. Of the 51 iPFRR17 attendees, 41 comprised the patellofemoral pain expert panel. All panel members were active researchers in the field of patellofemoral pain and covered disciplines of physiotherapy, athletic training, podiatry, biomechanics, biomedical engineering and human movement science. A proportion of panel members were also practitioners with experience managing patients with patellofemoral pain. Summary tables developed by the consensus group were provided to the expert panel during the consensus meeting. New evidence was presented alongside each statement from the 2015 Retreat. New statements were formulated where new interventions were identified, based on the evidence, for the outcomes of interest (pain, function and overall improvement). During the consensus meeting, the consensus group led discussions for each intervention regarding details of included papers, as well as clarification and finalisation of each statement. Following the discussion, the expert panel was instructed to integrate the evidence for each intervention (presented in the summary tables), with their expert opinion and knowledge, to vote on the appropriateness of new and revised statements. A 10-point scale was used to rate each statement, where 0 was ‘not appropriate’ and 9 was ‘appropriate’.11 14 Pooled scores were calculated to represent the median appropriateness score for each intervention statement, with IQRs. We considered median scores of 0–3 to represent ‘inappropriate’, 4–6 as ‘uncertain’ and 7–9 as ‘appropriate’.11 The consensus group made final recommendations based on statements that had consistency between voting and associated evidence. The search strategy yielded 655 papers (311 systematic reviews; 344 RCTs). After title, abstract and full-text review, six systematic reviews and an additional 13 RCTs that were not in the systematic reviews met the inclusion criteria. No additional papers were identified by the consensus panel. There were no new systematic reviews on specific interventions outside of the categories from the 2016 Consensus Statement11; thus, no new intervention categories were added. Quality ratings for included studies are presented in table 1 (systematic reviews) and table 2 (RCTs). Figure 1 summarises the updated consensus process. We identified two low-quality systematic reviews15 16 and three moderate-quality RCTs17–19 on exercise therapy; one low-quality systematic review20 and one moderate-quality RCT21 on combined interventions; one high-quality22 and two low-quality23 24 systematic reviews and two RCTs (one high-quality,25 one low-quality26) on patellar taping and bracing; and two high-quality,27 28 three moderate-quality18 29 30 and two low-quality31 32 RCTs on other adjunctive interventions. No new systematic reviews or RCTs were identified that related to foot orthoses. Summary of 2017 update of the 2016 Consensus Statement. RCTs, randomised controlled trials. Ten of the 24 statements voted on by the expert panel from the 2015 Retreat had additional evidence incorporated (table 3). For eight of these statements, the recommendation did not change despite integration of new evidence. These statements remained unchanged and therefore were not voted on by the expert panel at the 2017 Retreat. All voting that took place was for statements regarding other adjunctive interventions. Outcomes are presented in figure 2. We identified new evidence for two statements that were presented at the 2015 Retreat, relating to acupuncture/dry needling and manual soft tissue techniques. These were voted on again in 2017, based on the new evidence (table 3). Consensus voting for new evidence for new and updated recommendations for other adjunctive interventions. Left whisker: quartile 1; orange box: quartile 2; black line: median; blue box: quartile 3. RCT, randomised controlled trial. We also identified new RCT evidence for interventions that were not discussed at the 2015 Retreat. Three new statements relating to other adjunctive interventions were presented to the expert panel. Voting was conducted for recommendations on blood flow restriction training and gait retraining (table 3). The third statement referred to platelet-rich plasma; the expert panel felt that these injections should be excluded from this Consensus Statement as it is more aligned with medical/pharmacological interventions than physical interventions. Exercise therapy is recommended to reduce pain in the short, medium and long terms and improve function in the medium and long terms. Combining hip and knee exercises is recommended to reduce pain and improve function in the short, medium and long terms, and this combination should be used in preference to knee exercises alone. Combined interventions are recommended to reduce pain in adults with patellofemoral pain in the short and medium terms. Combined interventions as a management programme incorporates exercise therapy as well as one of the following: foot orthoses, patellar taping or manual therapy. Foot orthoses are recommended to reduce pain in the short term. Patellofemoral, knee and lumbar mobilisations are not recommended in isolation. Electrophysical agents are not recommended. These recommendations will provide medical and health practitioners with evidence-based guidelines for managing patients with patellofemoral pain. Considering the widely held view that patellofemoral pain is a multifactorial condition, as highlighted in our previous consensus statements,33–35 these recommendations are not intended to be prescriptive for all patients with patellofemoral pain. Rather, in line with evidence-based practice and shared decision-making models, they should be integrated with assessment findings, patient preferences and goals and clinical expertise. In the 2 years since the 2015 Retreat, we identified and included 6 systematic reviews and 12 RCTs that had been published, highlighting the continued output of levels 1 and 2 evidence for exercise therapy and physical interventions for patellofemoral pain. Findings of these papers were integrated into existing consensus statements. This new evidence was sufficient to update recommendations for acupuncture and dry needling, and manual soft tissue techniques, which were subsequently voted on by the expert panel. We also formulated new consensus statements on blood flow restriction training and gait retraining, on which the expert panel also voted. All statements that were voted on were in the category of ‘other adjunctive interventions’. The expert panel considered that the recommendation for each of these interventions was uncertain, based on the best available evidence and their clinical expertise. We recommend that practitioners use high-value interventions in the first instance, based on the panel’s six key recommendations, and use these adjunctive interventions where indicated for individual patients until high-quality evidence supports or refutes their use. Acupuncture was identified as an area of uncertainty in the 2016 Consensus Statement,11 based on findings of one moderate-quality systematic review.36 A new high-quality RCT evaluating dry needling to trigger points27 was identified in the 2017 update. While the expert panel acknowledged that acupuncture and trigger point dry needling have key differences in their clinical indication and application, it was decided to group them in a single recommendation on the basis that evidence for both was limited and uncertain. If additional RCTs are published in the future, it is anticipated that acupuncture and dry needling will be considered separately. There is also uncertainty around the use of manual soft tissue techniques for patellofemoral pain. New studies revealed no significant effect on pain when myofascial techniques were added to hip-focused exercises (vs exercises alone),32 as well as small clinically non-meaningful effects on pain and function with ischaemic compression compared with lumbopelvic manipulation.29 This was considered alongside evidence from the 2015 Retreat, which identified no improvements in pain following ischaemic release to peripatellar and retropatellar regions, compared with ischaemic release at the hip.37 The uncertainty surrounding manual soft tissue techniques reflects expert opinion reported in the mixed methods paper by Barton et al,12 where massage was considered to add limited value by one individual, while another stated it played a ‘big role’ in patellofemoral pain management. Blood flow restriction training was added to the consensus discussion after identification of one high-quality RCT.28 The patient performs lower load strengthening exercise with a tourniquet placed around the proximal thigh (eg, pneumatic cuff and elastic wrap).28 In musculoskeletal pain conditions such as anterior cruciate ligament reconstruction and knee osteoarthritis, this can be more tolerable than heavy load training and result in greater strength gains when compared with low-load training used in isolation.38 The RCT evaluated the effects of blood flow restriction in conjunction with low-load knee-focused exercise therapy, compared with standard high-load quadriceps strengthening programme.28 Although there was a significant reduction in pain during activities of daily living after 8 weeks, between-group differences were less than the minimal clinically important difference for pain using a VAS (20 mm).39 There were no effects on worst knee pain or function at 8 weeks and no effects on any outcome measure at 6 months. On this basis, the expert panel considered there to be uncertainty regarding blood flow restriction training for patellofemoral pain. Considering that this is a new approach to exercise therapy in patellofemoral pain, further high-quality RCTs are needed before evidence-based recommendations for its use or not in patellofemoral pain can be made. Gait retraining was also incorporated into consensus discussions at the 2017 Retreat, on the basis of two new moderate-quality RCTs that met the eligibility criteria.18 30 Given the current popularity of gait retraining for patellofemoral pain, this generated a large amount of discussion, including whether it should be considered a separate intervention category. Because there was no systematic review evaluating RCT evidence for gait retraining in patellofemoral pain, it was considered to be an adjunctive intervention. One systematic review was excluded from consideration on the basis that it did not identify any published RCTs at the time of their search (April 2015).40 The expert panel voted that there was uncertainty regarding the short-term effects of gait retraining on pain and function, based on evidence available at the time of the consensus meeting. Esculier et al 18 reported no effects on pain and function over 5 months when gait retraining (personalised programme focused on increasing step rate, landing softer and adopting a non-rearfoot strike pattern) combined with load management education was compared with exercise and load management education, or load management education alone, in runners with patellofemoral pain (n=69). In comparison, a small RCT of 16 runners who were self-reported rearfoot strikers found that 2 weeks of gait retraining (focused on transitioning from rearfoot to forefoot strike pattern) significantly reduced patellofemoral pain immediately after retraining and at 1-month follow-up, compared with no intervention.30 Differences between the two studies extend beyond the selection of runners (eg, rearfoot strikers30 vs any footstrike pattern18), choice of running retraining techniques, choice of comparator and sample size, to approaches used to attain gait retraining effects (eg, motor retraining principles).41 42 It is recommended that robust RCTs of gait retraining of runners (and walkers) with patellofemoral pain be conducted. These should focus on the specific gait variables that are associated with PFP,40 43 include larger samples and evaluate participants over a longer follow-up period in order to establish the role of gait retraining in patellofemoral pain. Exercise therapy is the intervention of choice for patellofemoral pain, with the largest body of evidence supporting its use to improve pain and function in the short, medium and long terms. Our literature search identified two new systematic reviews15 16 and three new RCTs17–19 on exercise therapy that were integrated into recommendations from the 2016 Consensus Statement.11 These new findings strengthened the evidence that underpins our previous recommendations on exercise therapy for patellofemoral pain. Thus, it is recommended that exercise targeting the hip and knee is a key component of management for all patients with patellofemoral pain, particularly when used in combination. Our findings suggest that further studies evaluating the effectiveness of similar exercise therapy programmes may not be warranted. Research efforts may be better directed towards determining the optimal exercise dose for patellofemoral pain, especially in light of poor reporting of exercise prescription parameters.44 This will further facilitate the implementation of RCT findings into clinical practice and optimise the potential benefits of exercise therapy for patients with patellofemoral pain. The literature search did not identify any new evidence to change recommendations for interventions that are not effective for patellofemoral pain. The expert panel recommends against the use of patellofemoral, knee and lumbar mobilisation, as well as electrophysical agents, as primary interventions when managing patients with patellofemoral pain. It should be noted that patellofemoral mobilisation can be used as a component of a combined intervention approach where appropriate, with evidence and expert opinion in support.12 Considering the shift towards active, movement-based physical interventions for patellofemoral pain and musculoskeletal pain more broadly, it is advised that these passive interventions should not be the focus of future RCTs. There remain key areas of uncertainty regarding exercise therapy and physical interventions for patellofemoral pain. We found no new evidence to address uncertainty surrounding selection of hip-focused over knee-focused exercise therapy, combined interventions in adolescents with patellofemoral pain, patellar taping and bracing and the use of other adjunctive interventions such as acupuncture and manual soft tissue therapy.11 The 2017 consensus meeting also highlighted additional areas of uncertainty, being the use of blood flow restriction training and gait retraining. It is important to reiterate that these interventions may still have a place in managing patellofemoral pain, but that further research is required. Based on outcomes of the consensus meeting, our consensus group highlights key areas of focus for future studies on exercise therapy and physical interventions for patellofemoral pain. While we are encouraged by the continued output of levels 1 and 2 evidence for patellofemoral pain, studies addressing the condition across various stages of the lifespan are required (eg, adolescents and adults over 40 years of age). Further high-quality RCTs are required for a number of interventions. These should focus primarily on active interventions that have the capacity to induce long-term improvements in pain and function. There is a clear need for minimum reporting standards in patellofemoral pain publications to allow replication of interventions in clinical practice.44 These are currently being developed by members of the iPFRN and will feature in a future publication. We are also developing consensus around factors that influence treatment response. The next update to the consensus statement on exercise therapy and physical interventions will be in 4 years, at the 7th International Patellofemoral Research Retreat in 2021. Recommendations from the consensus meeting on exercise therapy and physical interventions held at the 5th International Patellofemoral Research Retreat (Gold Coast, Australia, 2017), support the use of exercise therapy (especially the combination of hip-focused and knee-focused exercises), combined interventions and foot orthoses to improve pain and/or function in people with patellofemoral pain. The use of patellofemoral, knee or lumbar mobilisations in isolation, or electrophysical agents, is not recommended. There is uncertainty regarding the use of patellar taping/bracing, acupuncture/dry needling, manual soft tissue techniques, blood flow restriction training and gait retraining in patients with patellofemoral pain. The 6th International Patellofemoral Research Retreat will be held in Milwaukee, Wisconsin, USA, in October 2019. The authors wish to thank all members of the expert panel who participated in the consensus meeting at the 2017 International Patellofemoral Research Retreat.
. Pain, function, and strength outcomes for males and females with patellofemoral pain who participate in either a hip/core- or knee-based rehabilitation program. Int J Sports Phys Ther 2016;11:926–35.
. The effectiveness of exercise therapy based on Sahrmann approach in patients with patella-femoral pain syndrome. J Babol Univ Med Sci 2016;18:7–13.
. Knee orthoses for treating patellofemoral pain syndrome. Cochrane Database Syst Rev 2015;12:CD010513.
. Analysis of outcome measures for persons with patellofemoral pain: which are reliable and valid? Arch Phys Med Rehabil 2004;85:815–22.
. Foot orthoses and physiotherapy in the treatment of patellofemoral pain syndrome: randomised clinical trial. BMJ 2008;337:a1735.
. PROSPERO International Prospective Register of Systematic Reviews. https://www.crd.york.ac.uk/prospero/display_record.php?RecordID=82527 (accessed 31 Mar 2018).
. PROSPERO International Prospective Register of Systematic Reviews. https://www.crd.york.ac.uk/prospero/display_record.php?RecordID=78575 (accessed 31 Mar 2018). Funding The British Journal of Sports Medicine provided an unrestricted grant to support the 5th International Patellofemoral Research Retreat.